Every year the US Congress enacts or removes legislation to reduce or increase limits to the tax code. Although many of these legislative changes occur throughout the year most Americans don’t realize how these changes impact their take home pay until the April 15th tax filing deadline. 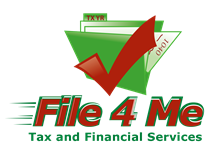 If any of the following changes happened to you in the previous year, you need to speak with a File 4 Me professional. Employee Expense – expenses you incurred that are not reimbursable by your employer, may be eligible as an employee business expense. Inheritance and Gifts – Inherited property receives a stepped-up basis to fair market value.